KM Gardens is a boutique husband and wife run landscaping and hardscaping company that was formed in 1992. Patios, Walkways, Pool Decks & More! Whether it be a simple elegant front walk or entrance to a house, or a sprawling outdoor living space KM Gardens creates works of art that are sure to impress. KM Gardens designs provide four seasons of interest, filled with colors and textures that brighten any landscape whether it be in the peak of summer or the doldrums of winter. Please contact us for your next landscaping and/or hardscaping project. We promise to get back to you to set up a free consultation. Owner Kirsten MacLaughlin graduated with a B.S. in Environmental Design from Delaware Valley College, an agricultural school situated in Doylestown, PA. Following graduation, Kirsten continued to pursue her passion for horticultural design, working at local garden centers and for various contractors. After contributing to several successful projects, Kirsten was inspired to form her own company, Kirsten MacLaughlin Gardens, in 1992. 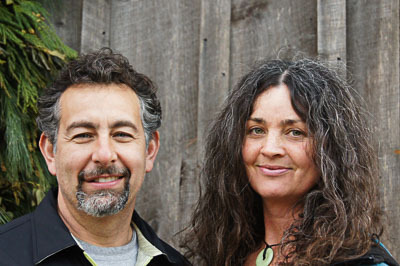 Husband Scott Silberman joined Kirsten in 1996, expanding the company to include hardscaping design and installation in addition to horticultural design. Kirsten and Scott live in Downingtown with their three children, Quincy, Cassy and Josie, where the family enjoys spending time outside in the beautiful garden they’ve cultivated on the grounds of their historic farmhouse. Our mission is to provide you with a personal experience from beginning to end. We are sensitive to any budgetary, timeframe, or maintenance concerns that you may have, and are very flexible in working at a pace that is comfortable for you. Our growth is largely a result of the strong relationships we have built with our customers and we look forward to building this same rapport with you. Creating beautiful landscapes that are also ecologically functional is something that inspires us. Yes, we can have a lovely garden that gives us four seasons of interest, but also a garden that is interconnected to all living things, and that provides sustainability to the ecosystem that we all share. 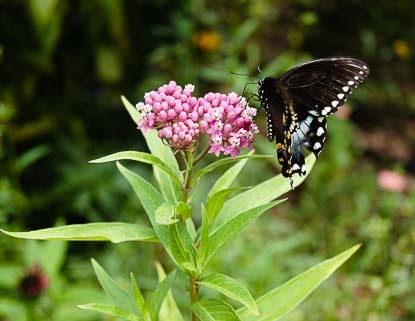 Our gardens are crucial to sustaining biodiversity, and we want everyone to be a part of that. 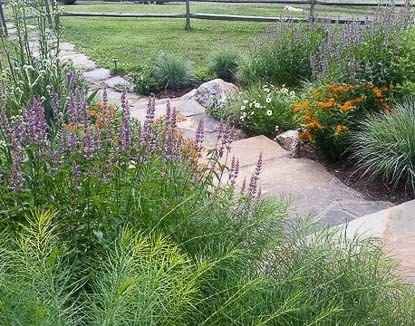 Using native plants is how we can achieve this wonderful balance of beauty and fuctionality, providing you with a landscape that welcomes and engages you. We design for the long term, using the right plants in the right place. Layering diverse native trees, shrubs, and perennials in a way that eventually makes maintenance easy is our goal. Watering, weeding, and invasive pests become infrequent over time, which gives us all more time to decompress and enjoy the garden. Nature is a wonder to behold, and creating landscapes where you can see it all up close, the birds, butterflies, bees, the textures of leaves and the beauty of the flowers, all brings us closer to something special. 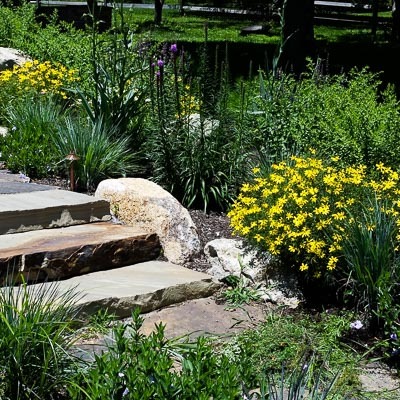 Hardscaping is the act of creating a man-made feature in the landscape. Walkways, patios, outdoor kitchens and living spaces are just a few features that KM Gardens enjoys creating. We want our landscape features to be a foundation for a home's outdoor environment to be built with care and thought for the future. 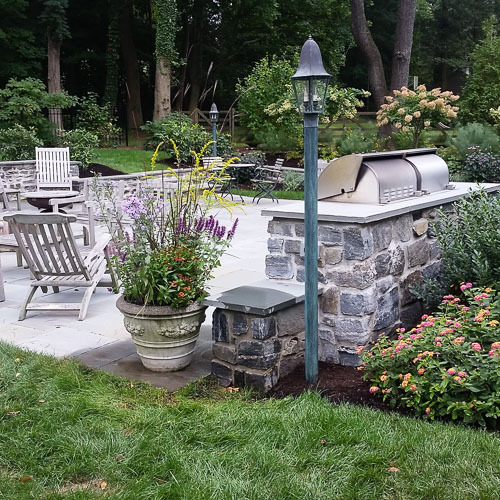 Here in Southeastern Pennsylvania the environment can be unfavorable at times so we take great care in constructing our projects with the elements in mind so that years later these beautiful works can be enjoyed. From a design perspective we relish working with people to make their visions a reality. We can design a space by bringing new ideas or incorporating your vision for the area. 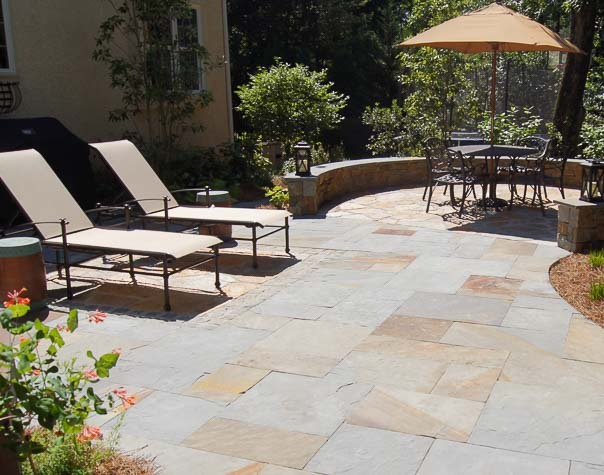 A Pa Bluestone flagstone walk or patio is something that is elegant and timeless. 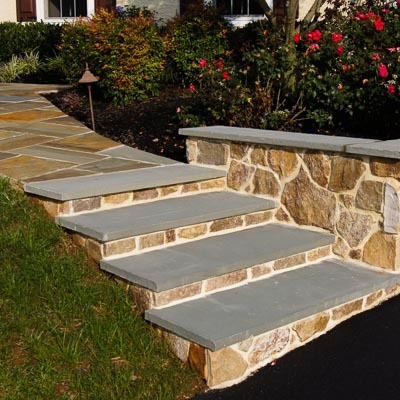 Natural stone retaining walls and steps tie the home into it's natural surroundings. Outdoor living spaces are a way to extend the home's livable area with outdoor kitchens and sitting areas. Roofs, pergolas, and finished ceilings under a deck can provide shade to enjoy the fresh air. A pond, fountain, or waterfall soothes with sound. With all of these hardscaping features available one can imagine a way to create a completely unique and magnificent outdoor environment to enjoy for many years.